​Of course the best way to spark interest in a rainbow is to see one in the sky, but if this is not possible, then make your own. Hold up a magnifier lens so that a sunray shining through the window goes through it and separates into a color spectrum. Or set a glass of water near a window so that the sun shines through the water. Catch a rainbow – reflect sun from a watch face lens and make the spectrum appear in different parts of the room. Chase it. Set out some crayons or chalk in each of the rainbow colors, discuss the colors and experiment with them on white paper. ​Sometimes we can see a rainbow arc in the sky, when sunshine shines though raindrops. This doesn’t happen very often. Most of the time when it rains, clouds are covering the sunshine. Sunlight looks white, but it is really made up of different colors. When the sunlight reflects off lots of raindrops (like a mirror), we can see all the colors. Rainbow spectra always have the same 7 colors in the same order – they are red, orange, yellow, green, blue, indigo (deep blue) and violet. Sometimes indigo and violet are categorized together, as one color. If there was sunshine and no rain, or rain and no sunshine, could we see a rainbow? ​​Paint a rainbow on a glass door or window with thick tempera with Joy soap added. Have available the 7 (or 6) colors using crepe paper streamers or curled strips of construction paper. Attach the ends to a paper plate (or similar) with staples, tape or glue. Use to dance, jump, run etc., especially outdoors. Paint with liquid watercolors (on white paper) in the primary colors of blue, red and yellow. Mix them and discover new colors. Blow bubbles outdoors and look for colors in the bubbles. 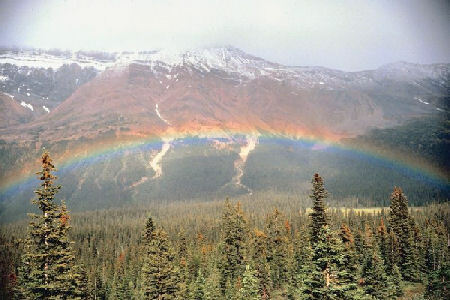 Rainbow myths (older children): leprechaun and pot of gold; bridge between heaven and earth; that a rainbow is “magic”.